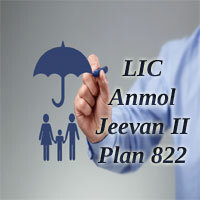 LIC Anmol Jeevan II (Plan no. 822) was introduced by the Life Insurance Corporation on 3rd February 2014 as per the new IRDA guidelines. LIC Jeevan Anmol 2 is a pure term plan with no bonus facility available. In this LIC Anmol Jeevan plan, if the life insured dies within the policy term, the death benefit is payable to the nominee. So if nothing happens to you till the maturity period of the plan, nothing will be returned. The unique identification number (UIN) for this plan is 512N285V01. This UIN should be used in all relevant documents provided to the policyholders. What are the features of LIC Plan No. 822? Only Death Benefit and No maturity benefit. High-Risk coverage can be utilized at low cost. Sum Assured of Rs. 6 Lakhs to Rs. 24 Lakhs can be opted. Tax benefits are applicable under Section 80C. Death Benefit: LIC Plan 822 provides the facility of a one-time death benefit of up to INR 24 Lakh to the nominee of the life assured. It comprises of one huge amount based on the opted premium value. This Death Benefit is valid only during the tenure of the plan and fails once the plan reaches its maturity. So there will be no compensation for death of the insured after completion of the policy term. The Death benefit of Jeevan Anmol II is tax-free. Maturity Benefit: As LIC Anmol Jeevan II is a term plan nothing will be paid to the insured if he/she survives the term of the policy. Tax Benefit: Under Section 80C of Income Tax Act, 1961 India, every year Rs. 1,00,000 INR was allowed as a deduction from the taxable income. Grace Period: A Grace Period of not less than 30 days will be allowed for the payment of premium. If the death of the Policyholder occurs within the grace period, the policy will still be valid and benefits are paid after the deduction of the said unpaid premium. If the premium is not paid before the cessation of the grace period, the policy lapses. Cooling-off period: If the Policyholder was not satisfied with the Terms and Conditions he/she might return the policy to the corporation within 15 days. The count should be from the date of receipt of the policy. Policy completed under Corporation’s Employee Insurance Scheme (CEIS) will be eligible for the CEIS rebate as a percentage of the tabular annual premium. Plan No. 822 should not be taken through any Agent/ Broker/ Corporate Agent/ Direct Sales Executive, etc. The Additional premium for Half-yearly mode was 2% of tabular annual premium rates and High Sum Assured rebate will be Nil. LIC Jeevan Anmol Calculator is used to calculate the premium amount once a year or twice a year. Through Anmol Jeevan 2 Premium Calculator, you can calculate the LIC Anmol Jeevan II Premium amount that has to be paid to get all the benefits available under this policy. The data required for calculating premium rates using Anmol Jeevan Calculator are Name, Email-Id, Age, Term, Sum Assured, etc. The major drawback why a lot of people stayed away from LIC term plans is because of their high price. When compared with online or offline term plans available with other insurers in India, insured think that these are costly. But few still tried to buy Anmol Jeevan term plans with LIC because of their faith in it and to diversify their risk among the insurers. The Buying procedure of LIC Anmol Jeevan II plan is very simple if you have all the information regarding documents with you. Life Assured can buy the LIC Plan 822 either in online or offline mode. Visit the LIC Direct website and fill the application or proposal form. The guidelines regarding how to fill the form, and required documents are mentioned in detail there. Policyholders have to provide their Education details, Occupation, PAN details, Medical history, Form 16/ ITR for last 3 years or Pay slip for last 3 months, Existing life insurance plans, etc at the time of filling the form. The Premiums are paid once in a year or twice in a year but within the Grace period. You can make the payment through Net Banking or Credit Card or Debit Card. The Insurers have to approach the LIC agents in offline mode and pay the premium by Cash/ Cheque/ Demand Draft at the cash counter of any LIC Branch Office. Those agents will give instructions and guide you about LIC Jeevan Anmol II Plan in detail. Before buying the policy, you have to keep the following documents with you. Loan Facility: No Loan will be granted for this Lic New Anmol Jeevan Plan. Surrender Value: The LIC Term plan 822 doesn’t acquire any Surrender values. Paid up Value: No Paid up value will be available under this plan. Service Tax: 14% Service tax is applicable for the premium paid every year. Back-Dating Interest: The policies can be dated back to the same financial year. No dating back interest shall be charged. Policy Revival: If the premium was not paid within the grace period, then the policy will lapse. The Lapsed policy may be revived within a period of two years but during the life time of the Life Assured. Proposal Forms: Proposal Form no. 300 and 340 as applicable should be used for this LIC Anmol Jeevan II plan. Riders: No riders are available for this Term Plan no 822. Assignments/ Nominations: Assignments or Nominations for Plan 822 should be made at the proposal stage as per Section 39 of Insurance Act, 1938. Suicide Clause: The Policy will become void if the life assured commits suicide within one year from the date of commencement of risk or from the date of revival. An amount equal to 80% of the premiums paid till the date of death shall be paid. 1. What is Sum Assured? A. Sum Assured is the amount of money guaranteed to be paid on Policy Maturity and also the amount of life cover for which the policy holder is being insured. 2. What happens if a policyholder stops paying the premium? A. If the policyholder stops paying the premium, the policy will lapse and the policy will be no more in force. No life insurance coverage will exist on the policyholder with a lapsed policy. 3. Can I get any Maturity benefit in the LIC Anmol Jeevan II plan? A. No benefits shall be payable on Survival to the end of the policy term.